Overlaid on these signs of decay, is a looming threat to the planet itself. Huge floods in countries such as India, Nepal, Bangladesh and the U.S. indicates that climate change has already started. Yet even the modest targets for carbon reduction have been frequently missed—and that was before Trump tore up the Paris accord. One result of these developments is a polarisation of politics to both the left and the right. The ‘extreme centre’ which dominated Western politics is weakening. This was built on a consensus around the priorities of capital and an Atlanticist orientation whereby both conservative and social democratic rivals in EU countries forged a consensus around U.S. ‘leadership’. In recent decades, however, the organisational roots of mainstream parties have wilted. 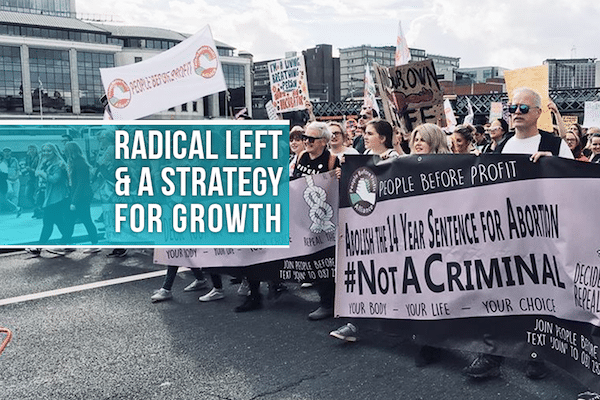 While shifts to the left can start with the politics described above, they cannot achieve their aims within this framework. Some of the leaders who articulate broad working class discontent with austerity are trapped within parties that brought about that austerity. Bernie Sanders was a voice for ‘socialism’ during the U.S. Presidential elections but afterwards he mounted a unity tour to heal divisions in the Democratic Party with Tom Perez, a labour secretary under Obama. Jeremy Corbyn is a stronger advocate for left politics—and the British Labour party he leads has considerably deeper links to the organised working class than the U.S. Democrats—but he is being held hostage by a parliamentary party that has systematically disappointed its working class supporters. More generally, the articulation of leftist sentiment occurs largely on the terrain of electoral politics. A failure to mobilise and encourage a sense of empowerment amongst workers limits its possibilities. The reason is that a key element in right wing ideologies today is a promotion of a fatalism which both recognises discontent but dissolves it in a rhetoric that ‘we are where we are’. A purely electoral strategy—or even a strategy that subordinates mobilisation to electoral considerations—will therefore only lead to limited advances. The experience of the May 15 indignado movement in Spain, or in a more complex way the Occupy movement in the U.S., indicates this pattern. Although there was an initial rejection of political parties, the power of the state pushed activists into either developing new parties or participating in parties. Podemos grew out of a movement that rejected politics and then transformed itself into a relatively top-down electoral machine. Many of those who joined the Occupy Movement in the U.S. found their way into supporting Bernie Sanders when he ran for U.S. President. The trajectory towards political engagement is not automatic and nor is it the sole trend. But it certainly exists as possibility for sections of the social movement left. If this is the case, the key questions become; What type of party? How does grassroots involvement continue? How does the anti-capitalist impetus continue? A political alliance that coalesces into a distinct organisation needs to be forged between those who want to want to break from the pro-austerity politics of traditional parties, activists from social movements who want a political expression and a revolutionary left that is willing to break from sectarianism. In many countries, there are similar themes that working people want political action on. These include end zero hour contracts, precarious working conditions, a defence of pension rights, abolition of student debt, for a national health service that treats according to medical need and not the size of one’s wallet. In addition, there are a host of social issues which despite its pretence at liberalism and equality, modern capitalism has not solved. These include a support for refugees, opposition to racism, support for abortion rights, gay marriage. In addition, there needs to be a strong anti-imperialist component to any new left that challenges the role of U.S. imperialism in particular in seeking to dominate parts of the globe. It is perfectly possible to develop a programme to fight on these issues—even if there are differences on how they can ultimately be resolved.